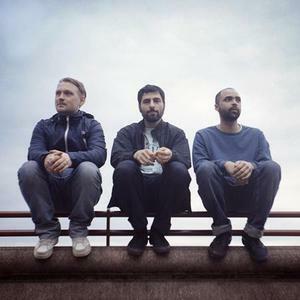 Junip is a Folk Rock band (Healing and Easy listening according to their myspace) that have existed since 1999, maybe even 1998, in Gothenburg, Sweden, formed by Jos&eacute; Gonz&aacute;lez (guitar, vocals), Elias Araya (drums) and Tobias Winterkorn (organ, moog). Their first 7-inch came out in 2000, followed in 2006 by the self-released ?BLACK REFUGE? EP. Junip has periodically gathered together to record when schedules permitted, including 2009's single ?Chickens/Azaleadalen?. Their first full album, "Fields", was released in 2010. Junip's sound can be familiar to those who have listened to Jos&eacute; Gonz&aacute;lez's critically acclaimed solo records, with organs, synths, and drums featured alongside his nylon-stringed guitar and distinctive voice. The songs are often dynamic, melodic and shadowy, with a remarkable sonic approach that is simultaneously intimate and atmospheric.